Influenza is a highly contagious viral infection that causes fever, head-ache, body aches, extreme fatigue, sore throat, and other symptoms. Joseph is not feeling well, but he goes to school anyway. He is coughing, sneezing, and starting to feel very tired. During lunch, several of Joseph's friends ask how he is doing. As Joseph starts to answer, he suddenly sneezes. It happens so quickly that Joseph cannot get his hand up to cover his nose. None of his friends sees or feels the microscopic droplets that come out of Joseph's nose at more than 100 miles per hour. They are unaware of the virus in the droplets as they inhale the air. Three digitized views of Type A influenza virus. The next morning, Joseph is not in school. The teacher says that he has influenza, commonly called the flu. For a couple of days, all of Joseph's friends feel fine. But the virus they inhaled is spreading through their bodies, latching onto the surface of healthy cells and infecting them. Then one morning, each of Joseph's friends wakes up with a fever and fits of coughing. Within a few hours, they feel as if they have no energy. They, too, have the flu. Influenza is a viral infection of the respiratory tract, which includes the nose, mouth, throat, and lungs. Although some people call any bad cold "the flu," influenza is different from the common cold (see sidebar). The flu virus spreads through the air and is easy to catch. Although most healthy people who catch the flu recover fully, sometimes the flu can be deadly, especially if patients develop pneumonia or have an underlying medical problem. A flu vaccination can prevent infection most of the time. As many as 20,000 Americans, however, die each year from the flu or its complications. Most people catch the flu during the winter and early spring, when they spend more time indoors in closer contact with other people. It affects all ages but is a special problem for the elderly and those with certain chronic medical problems. There are three types of flu virus, labeled Type A, Type B, and Type C. Type A influenza virus is the most threatening to humans, because every few years it can mutate, or change into new strains that can infect people. Humans develop the ability to fight off the viruses they encounter, especially after they have developed an infectious disease such as the flu. But when a new strain of Type A develops, the body's immune system is less prepared than usual to fight the virus. This can cause epidemics, like the one in 1918-1919 that killed 500,000 Americans and 20 million people worldwide (see sidebar). The word "influenza" derives from the word "influence," because people who lived during the 16th century believed that flu epidemics struck only when people were underthe influence of certain constellations of planets and stars. Type B also can cause serious cases of the flu, but it does not change its structure as drastically as Type A does. Type C causes milder cases of the flu and is much less common than Types A and B. The virus that causes the flu is contained in the respiratory excretions (the phlegm and mucus) of an infected person and is spread when people sneeze or cough. Even exhaled breath can contain microscopic droplets of the virus. Infection can happen in many ways: when someone like Joseph sneezes near others or when the air is recirculated by heating and cooling systems in classrooms, offices, and airplanes. Even touching an object such as a doorknob that an infected person has used—and later touching one's own mouth, nose, or eyes—can spread the virus. More than 8 million soldiers and almost 7 million civilians died during World War 1. But as the war was ending in 1918, another killer was rising: influenza. There have been other epidemics of influenza throughout history, but none compares with the one that circled the planet in 1918 and 1919. More than 20 million people died, including almost 500,000 Americans. 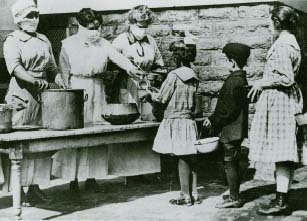 The flu began to spread in the spring of 1918, at first in military camps in the United States and France. Later, an epidemic in Spain received much publicity, which is why the event is sometimes called the Spanish flu. As soldiers from many countries came into contact with one another and civilians throughout Europe and the Far East, the flu epidemic spread worldwide. Such large-scale epidemics are called pandemics. Many people tookto wearing masks over their noses and mouths in the hope that they would not catch the flu. Sometimes individuals were not allowed into offices or on public transportation unless they wore masks. Some cities even hired people to spread disinfectant in the air to try to kill the virus. The pandemic accelerated research into influenza and the search for a vaccine. By the 1930s, doctors were able to isolate the virus and grow it in fertilized chicken eggs. This eventually led to the development of vaccines, which are still created using eggs. More than 20 million people died in the worldwide influenza epidemic of 1918-1919. Influenza viruses mutate frequently. Samples of the 1918 strain are no longer available for study, so the reason for its virulence (deadliness) remains a mystery. Volunteers in Cincinnati, Ohio, wear gauze masks during the great influenza epidemic. When people inhale the virus, it enters the bloodstream and begins to attack healthy cells. The virus uses the cells' protein-making capacity to make more of the virus, which attacks surrounding cells. These attacks trigger the body's immune system, which sends white blood cells to fight the virus. By this point—a day or two after exposure to the virus—people are beginning to show the signs of influenza. The day after Joseph felt the first symptoms of flu at school, he woke up and felt that he could not get out of bed. He had a high fever—about 102 to 104 degrees Fahrenheit—and felt chilled, and his head, muscles, and whole body ached. His chest felt congested, as if there were a few heavy bricks resting on it. His throat was sore, and he coughed and sneezed occasionally. 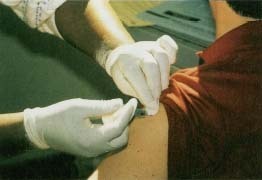 Vaccination: A medic gives a flu shot at a community health fair in New Jersey. The flu virus overwhelms the body's ability to fight it. The fever and aches result from the body's struggle to control and destroy the virus. White blood cells produce a protein called inter-leukin (in-ter-LOO-kin) that leads to aches, fever, and fatigue until the virus is eliminated. The fever often drops within 5 days. Other symptoms start to sub-side in a week, but the fatigue can last 2 or 3 weeks. Influenza can develop into pneumonia or bronchitis. Pneumonia (noo-MO-nya) is an infection of the lungs that causes them to become inflamed and fill with fluid. This interferes with the ability of oxygen to reach the blood and can sometimes cause death. With bronchitis, the larger air passages in the lungs become inflamed. Doctors diagnose the flu based on the symptoms. Many cold viruses can cause symptoms similar to those of the flu, but the symptoms usually are not as severe and do not last as long. Treatment involves bed rest and drinking lots of liquids to prevent dehydration * . Over-the-counter medications can help the fever, aches, and cough, but aspirin should be avoided during the flu or other viral infections because of its relationship to Reye's syndrome. Some strains of the flu can be prevented with a flu vaccination in the fall. The vaccine contains inactive versions of the flu viruses that researchers suspect will be most likely to cause influenza during the coming winter and early spring. Because the virus is inactive, people cannot catch the flu from a flu vaccine. The inactive virus causes the human body to create antibodies. When a live virus enters the body, the antibodies are ready to prevent it from attaching to cells and causing an infection. The vaccine does not ensure that people will not get the flu, but it is effective 70 to 90 percent of the time when the vaccine matches the strain of the flu going around. Flu shots are especially recommended for people in high-risk groups, such as the elderly and people with certain heart and lung diseases. Children can receive the vaccine but seldom do unless they have medical problems such as diabetes, HIV infection, heart conditions, or lung conditions such as asthma. Occasionally, people exposed to the flu may be given antiviral medications such as aman-tadine (a-MAN-ta-deen). Other ways to lower the risk of catching the flu include avoiding contact with people who have it and frequently washing hands thoroughly to avoid transmission of the virus. American Lung Association, (800) LUNG-USA (800-586-4872). This is a leading support organization that promotes flu education campaigns. Its website contains a great deal of useful information. Centers for Disease Control and Prevention, 1600 Clifton Road, N.E., Atlanta, GA 30333, (800) 311-3435. An agency of the U.S. Department of Health and Human Services, the CDC is a good place to get information on influenza and many other diseases. KidsHealth.org , created by the Nemours Foundation, has information on influenza and dozens of other infections. Hi, since last year I really don’t remember when but I’m sure it’s been 5th month I cannot recover from flu, it’s excessive flu day and night since last 5 months, I saw one physician one month ago she have medicines but those didn’t work anyway. I’m really depressed about this rare problem which most of people I asked don’t know. It’s just a flu no fever no any other symptom, some times one side of nose is blocked likewise same to another side of nose is blocked for months. Please help me about it. I’m 26 years old. I’ve done my medical for visa recently hepatitis B and C also HIV, all are normal in reports nothing showed up.